In service with 1 Health Support Battalion. 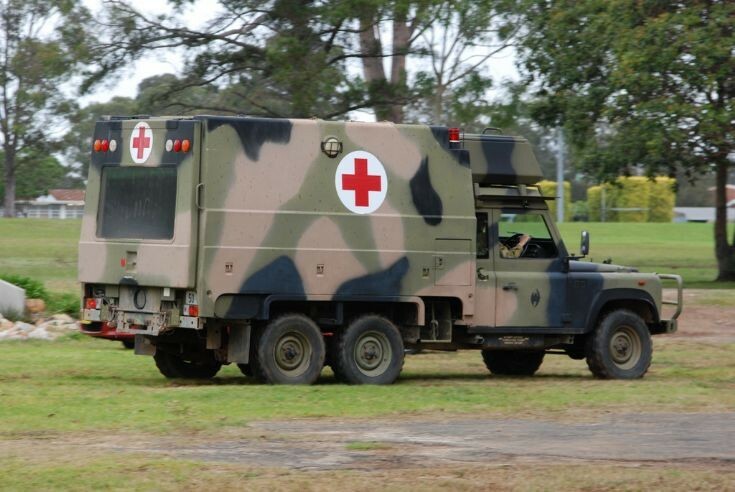 The “Perentie” Land Rover series 110 six wheel drive truck forms the basis of the Australian Army’s field ambulance fleet. The ambulance is fitted with a fibreglass rear body which can accommodate four stretcher cases or eight seated patients. Two medical orderlies occupy the cab. A large fibreglass storage bin is positioned above the cab. This vehicle is fitted with a self-recovery winch. The rear bodies of all Australian 6x6 Land Rovers (except the SAS Regiment’s Long Range Patrol Vehicle) have common attachment points and are interchangeable. I think that the manufacturer is actually JAGUAR-ROVER AUSTRALIA. Added by Roger Greenaway on 05 October 2010.